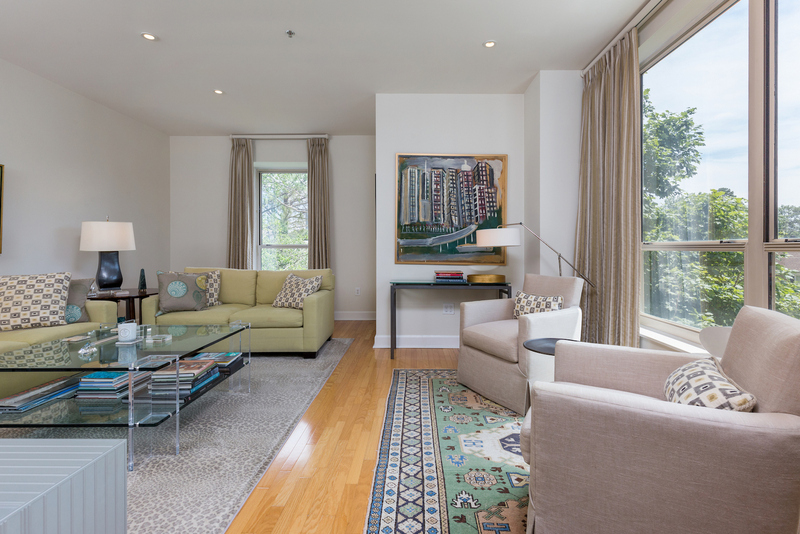 A three-bedroom, impeccably decorated condo in a part of Atlanta that exemplifies central. But there’s a catch: home prices are only rising in Buckhead (and have been for 38 months); inventory in Atlanta is low; and this unit is rare enough as it is. We’re not saying this because it’s our job, we’re saying it because it’s true: if you’re interested, act fast, because (at this price, especially), unit 607 isn’t going to be on the market for very long. Trying to buy just the right home in Buckhead is a challenge. Downright frustrating in many cases. Those reports of over a "thousand people a month" moving to Atlanta are true, and condo inventory is at an all-time low. Many buyers are left with the feeling they will have to snap up almost anything that pops up or be left behind. If you've had the discipline to wait for the ideal unit to appear, your patience may be rewarded here. A three-bed, three-bath condo. That’s a big deal. We’ll explain. When it was erected in 2001, The Peachtree Residences drew attention from a few different angles: The location was primo, to start with; from the outside, the midrise construction evoked a particular brand of metropolitan grandeur that managed to stay within the confines of contemporary timelessness; inside, a mix of one- and two-bedroom units (in a variety of floorplans) provided versatility to residents from all walks of life and orientations, from single professionals to young families. But you already knew that. There were, however, some three-bedroom units thrown into the mix. Not many of them — of the 121 units in this structure, they account for only a handful — but they do exist. And when they’ve come onto the market, well, they don’t last too long. 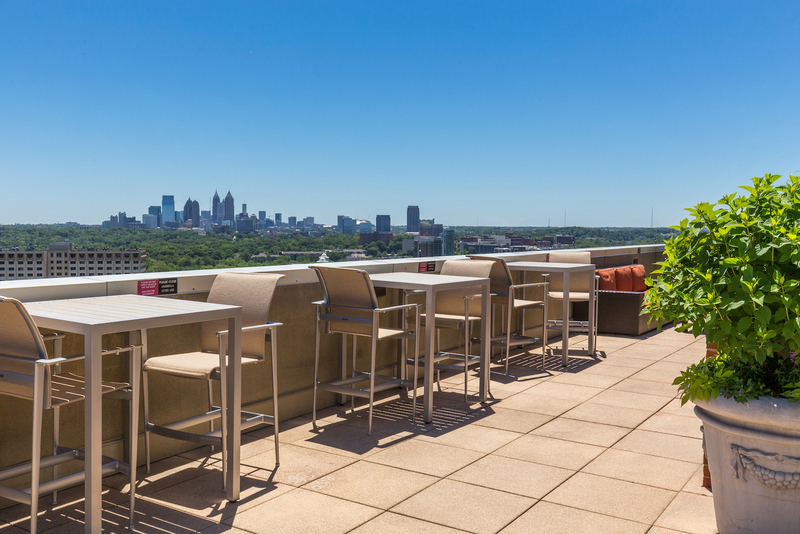 This isn’t only true for The Residences on Peachtree: if you’re in the market for a condo in this city, you’ll likely have already paid attention to more two-bed configurations than you can shake a stick at. But threes? Not so much. See, there’s a certain type of home-hunter: one who values the convenience of condominium living; the chest filling awe of a dynamite city view at night; the subtle luxury of contemporary aesthetics (and boy, does this place have that in spades — more on this in a second). Quality of house notwithstanding, there’s a reason condos are just so popular in Atlanta. 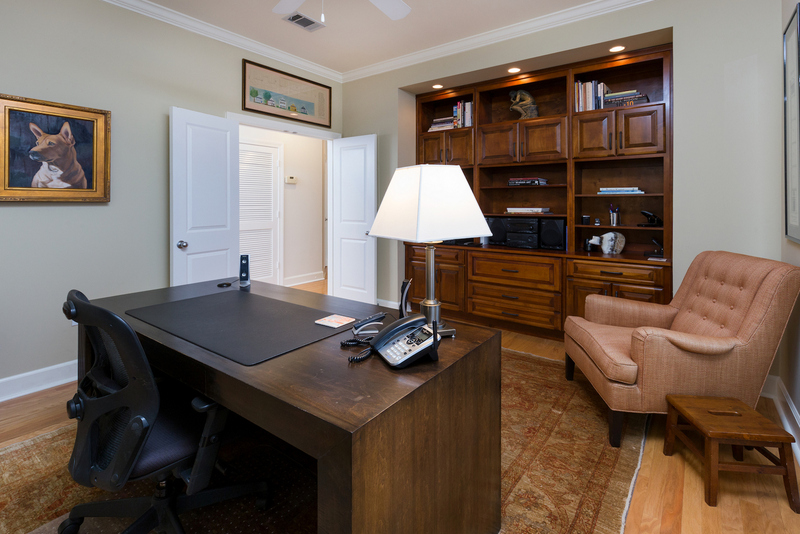 The tradeoff, usually, is being frugal with the square footage, where home offices are relegated to nooks in the corner of the living room, where guests get the pullout couch, and where relocation becomes necessary as families grow. But three bedrooms blending seamlessly with condo life? Man... that’s the sweet spot. OK, you have to hear about how this place looks. Out with it. The current owner of this unit is an architect; and a good one. We don’t want to draw stereotypes here, but when you have an individual who specializes in making spaces beautiful for a living, you can almost be guaranteed that their own home is going to be something for the ages. Definitely the case here. Beginning with a 2,106-square-foot space that already blended clean, modern lines with a whisper of classical Southern aesthetics, the whole space received a series of sophisticated customizations using only the highest quality fixtures, cabinetry, impeccably textured surfaces — even the interior designer paint has a nearly magical way of bringing the outside in, through the banks of near-floor-to-ceiling windows (Which, in the master bedroom and living room, provide unspoilt views of the Buckhead skyline over a canopy of lush green). All in all estimates clock the aggregate of these painstaking upgrades to come in at a ballpark of $150,000 — $30,000 of that on custom drapes alone (just to give you an idea). And then, there’s the third bedroom. With double doors leading indirectly from the central hall and a wall of dark wood built-in shelving and drawer space, there’s a quality to the space that evokes something… refined. Senatorial. For the work-from-home set, this isn’t just a space to keep your computer and WiFi router — this is a room where meetings are held, and where deals are struck. In short? If you wanted to teach architecture students how to orchestrate the proper combination of textures, surfaces, and materials for a contemporary palette, this place is the ultimate case study. The beating heart of a home lies between the kitchen and the living room. In this condo’s (very literal case), that responsibility falls to the dining room. The imagination doesn’t need to be stretched very far to see that, over the years, this space has hosted some fine dinner parties. Nothing raucous in an anonymous sort of way; rather, a semi-regular gathering of three or four couples who assemble in the hardwood-floored living room for a cocktail before retreating to the ample dining space for conversation, wine, and delicacies prepared in the streamlined, granite-topped kitchen just a few steps away. This is a condo, so there are bound to be some ultra-convenient elements on-site. And, this is a great condo, so it’s a safe bet that the amenities are going to be top tier. Lavish areas of indoor seating, fully equipped with brightly hued modern furnishings extend outside to brick-lined courtyards with bubbling waterfalls emptying into tastefully tucked-away fountains. Off to the side, ready and waiting, a full fitness center awaits early-risers who want to get their cardio up before heading to the office. Same goes for the rooftop courtyard. Please, please, please don’t pay a visit to this property without riding the elevator to the top of the building, where you’ll find a row of bistro tables overlooking one of the most fabulous views in the city, where the lush, historic forests of just-north-of-Atlanta are punctuated by clusters of glittering glass and steel towers off in this distance. Then, and only then, will you realize why they call Atlanta “The Green City.” Oh, and there’s a spa pool, too. Because it does get hot here, so it’s nice to know you can take a quick dip to cool off. There is an advantage you may not realize here unless you are thinking long term. 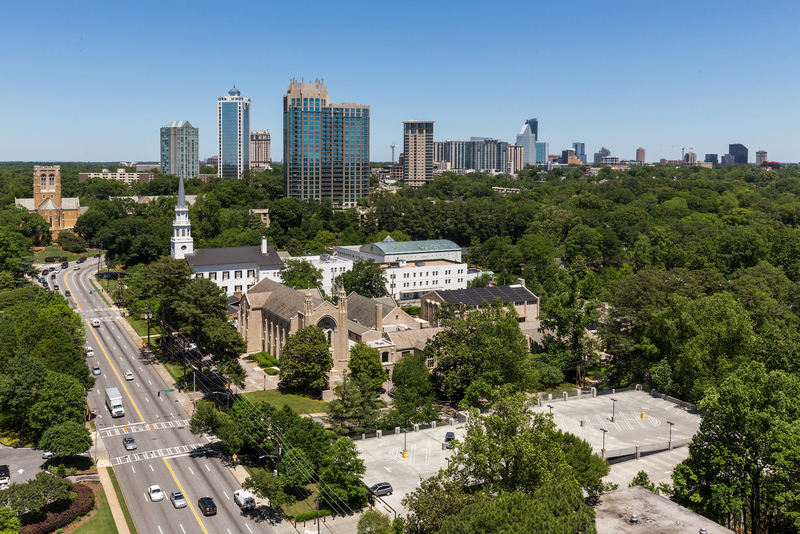 The Buckhead area seems to get better by the day with an upward price trajectory that's one of the steepest in the City. No doubt a positive side-effect of the wonderfully diverse mix of Southern hospitality and big city convenience. And there’s a sort of sweet spot quality to this stretch of Peachtree Road. At less than a mile from the heart of Buckhead, and fewer than two miles from the main drag of Midtown, residents of The Peachtree Residences get to enjoy a relative ease of commute to the main entertainment and commerce centers of the city (bonus points for the relative freedom from congestion that clogs up so many parts of the city at rush hour). The northern end of the Connector is just a few minutes away, leading to all corners of the Atlanta metro. (Just so you know, this unit does come with two reserved parking spots, so at least you won’t have to worry about parking woes when you get home). Close to home, a number of excellent eateries and convenient amenities like (two) shopping districts provide access to the essentials like pharmacies, grocery stores, and the like. The iron is hot. If this place presents your ideal combination of needs and wants, it’s time to strike. Its existing beauty has been refined to perfection by a pro. 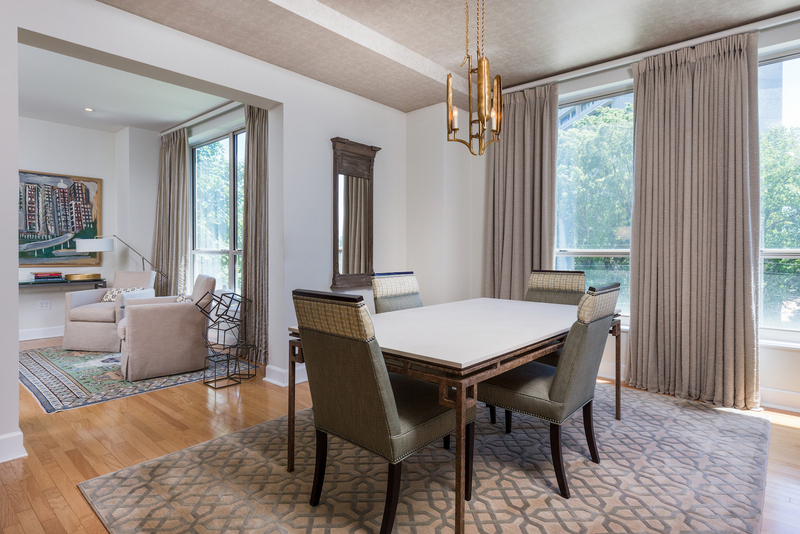 It’s modern but comfy; sophisticated, but never stuffy; it’s up to the challenge of entertaining guests, or being a soothing hangout spot for quiet nights in with the people you care about most. A rare 3 bedroom unit that's a perfect fit for those interested in downsizing from a larger single family home or for those looking to upgrade from a smaller condo. Either way, the seller has established a price intended to get the attention of a ready-to-act buyer. Maybe it’ll be you! What are you waiting for? If you're in the market (or know someone who is), get to this home right way because prices in Buckhead are up the last 38 months in a row. This unit won't last long.